On a recent Facebook post, we posed the question “Who do you like best: The Beatles or Rolling Stones,” and, not surprisingly, The Beatles came out well ahead of the other infamous 60’s era British group. The timing was pretty convenient since our June 20 Ringo Starr show had just gone on sale. The show is sure to be extremely professional and fun, and it’s been lighting up our phone lines for the past week. Needless to say, we’re pretty excited to bring the iconic drummer back to our stage. Given all of the love for The Beatles here in Central PA, we thought it’d be fun to find out how our upcoming performers connect to the Fab Four. Most recently, Jazz singer and piano player Diana Krall performed on Paul McCartney’s collection of jazz standards “Kisses on the Bottom.” The album, released on Feb. 7, features Krall – a 3-time Grammy winner – John Clayton, Eric Clapton, Stevie Wonder, and more present-day legends performing tunes made famous by Fats Waller, Irving Berlin, and even Sir Paul himself (a short video of Diana performing with Paul is below). Saturday Night Live veteran, and star of dozens of classic comedies, Steve Martin made his very first feature film performance in Sgt. Pepper’s Lonely Hearts Club Band where he sang “Maxwell’s Silver Hammer.” Now, over 30 years later Steve has collected Grammy award’s and top-selling albums by way of his banjo playing bluegrass releases. And of course, we can’t forget our love of the mop-tops as we presented our very own Original Show The AMT Band Plays Abbey Road in 2010. 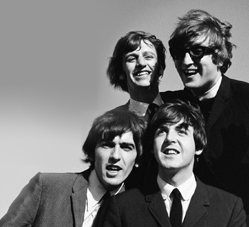 The show featured Abbey Road in its entirety in the first act, and then brought nearly two dozen of The Beatles’ hits in the second act to guests ears. There are plenty of other connections to the band that defined the 60’s – ranging from Glen Campbell to Frankie Vallie to The Buckinghams – and we don’t want you to miss out your chance to catch Ringo Starr on stage, right here in Lancaster.